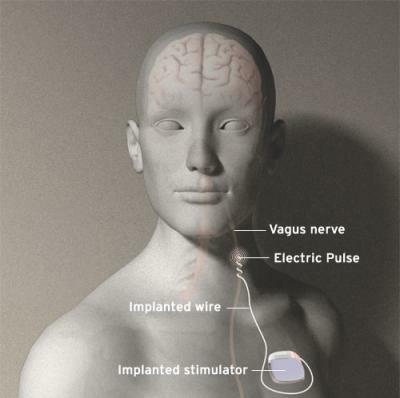 Vagus Nerve Stimulation, Does it Work? A recent systematic review shows that Vagus Nerve Stimulation (VNS) therapy has been reported to have antidepressant effects in open and longterm studies, but unfortunately the only blinded randomized trial was inconclusive. It is possible that much or all of the improvement reflected a placebo response or spontaneous remission. This makes placing VNS as alternative option for treatment resistant depression hard. Other alternatives are more evidence based: 9 steps for treatment resistant depression. This doesn’t exclude vagus nerve stimulation but postpones it to last resort treatment. Particularly for those with a chronic, highly disabling course of their depression. VNS solves the problem of compliance that is usually associated with regular treatments. Another positive point is the absence of a deleterious effect of VNS therapy on pregnancy.As a nonpharmacologic treatment, VNS does not pass through the placenta and is safe for the pregnancy and for the infant and allows a sustained remission of depression. VNS seems to improve sleep architecture and increase the amplitude of ultraradian sleep EEG rhythms in patients with treatment reistant depression. The side effects reported in long-term studies are generally the same as those reported in short-term studies. They are typically mild and restricted to the time of the stimulation. The high cost of the device. The invasive nature of the treatment. The biggest problem with VNS is the fact that only one randomized controlled trial has been published. Another important observation is that it takes a while before VNS starts to work, it takes a long time (months) before a decisive evaluation of efficacy can be made. VNS therapy would gain more credibility and become a serious option for a subgroup of depressed resistant patients. Sham vs true VNS could be tried in randomized, blinded trials, on top of treatment as usual in a large sample of patients with treatment-resistant depression. Bipolar depression and psychotic depression could also be potential targets for clinical trials with VNS. Cyberonics and Vagus Nerve Stimulation Back in the Race? Why is therapy — and I don’t mean 12 sessions of CBT — not part of treatment for “treatment resistant” depression? I confess that I am mystified that this conclusion is reached without considering that the problem is not biological. Sorry but I don’t understand the question. Therapy? Are you kidding, talking about your drug resistant depression isn’t going to help one damn bit. My sons father has been hospitalized four times in the last two years, he got out of the hospital after a 28 day stint with 12 ECT treatments and several times a day he had therapy. He is currently back in the hospital mental health ward after being home only 9 days. He is begging to go to a state facility, they told him his chances of that are slim to none. He is crying out for help and they keep him in this vicious cycle of hospital and therapy. When can he get the help he needs? Therapy in this case is a poor choice of placebo when a persons life hangs in the balance. Where do the statistics come from when determining the effectiveness of VNS for Treatment Resistant Depression ? I had an (experimental) implant (by Cyberonics) in Jan 2007. It saved my life. Although sadly, there has been no follow-up from anybody to know this. I wish I could shout to the world how it has helped me. I no longer require multiple meds or frequent hospitalizations… I have my life back.